The following is the third of a four-part retrospective article on the history of DreamWorks Animation through its films leading to the purchase by NBC/Universal on April 28, 2016. Catch up on Part One here and Part Two here. Ten years after being founded as a division of the DreamWorks SKG studio, DreamWorks Animation would split off as an independent production company. While DWA had the Shrek franchise to fall back on, the first four years on their own proved to have as many bumps as they had successes. Madagascar and Kung Fu Panda would be big hits, but Shark Tale, Over the Hedge, and Bee Movie only just managed to make some profit. The perceived under-performance of the otherwise beloved Aardman features Wallace and Gromit: The Curse of the Were-Rabbit and Flushed Away would lead to the partnership between the two studios to dissolve. And even Shrek The Third showed that DreamWorks’ bread and butter was losing steam by not reaching the financial success of the second film, also receiving the weakest critical and audience reception of the series. If the company was going to stay afloat on its own, they were going to need a lot of big hits outside of Shrek. Fortunately, DWA had some films that had been successful enough to build new franchises from, and their reputation was still solid enough to draw in highly respected creative filmmakers willing to offer their services in enhancing the overall presentation of their stories. 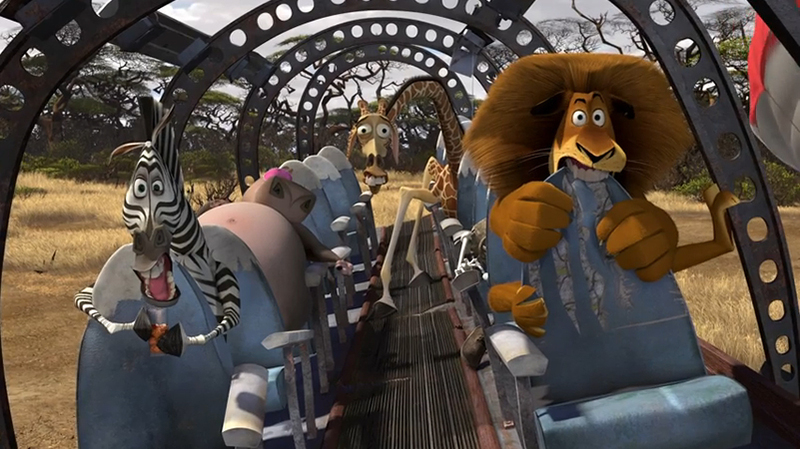 Madagascar: Escape 2 Africa would be the first non-Shrek sequel DreamWorks Animation would release. Picking up from where the first Madagascar left off, the displaced animals of the Central Park Zoo in New York continued their efforts to return home. Along the way, they would literally crash land in their ancestral home of Africa and connect with their own species. But it would not make them feel any less out of place than they were to begin with. The first film had a very unique look, a mixture of realism and fantasy that was very appealing. For the second film, DreamWorks and their partners at Pacific Data Images enhanced the visual style with beautiful results. The Savannah had never looked so lush and alive. The increased depth and definition to the animals was fantastic without taking away the vibrant personalities. I would venture to say that they were actually improved upon to really bring the characters to life. I wasn’t entirely sure where the story was going in the first Madagascar, but the second had a somewhat more focused narrative of the main animals rediscovering their natural environment. The overall plot was hit and miss, and with a lot more characters to keep track of it was not easy to appreciate how the multiple stories were being played out. But most of the returning characters were fleshed out just a little better, in particular the hypochondriac giraffe Melman. And some of the jokes connected more organically, particularly when coming from the Penguins and King Julien. The second Madagascar film was a bigger success than the first. Critics responded more favorably and audiences loved the characters even more. More importantly, it had a greater commercial run that was roughly equal to the Shrek films and Kung Fu Panda. 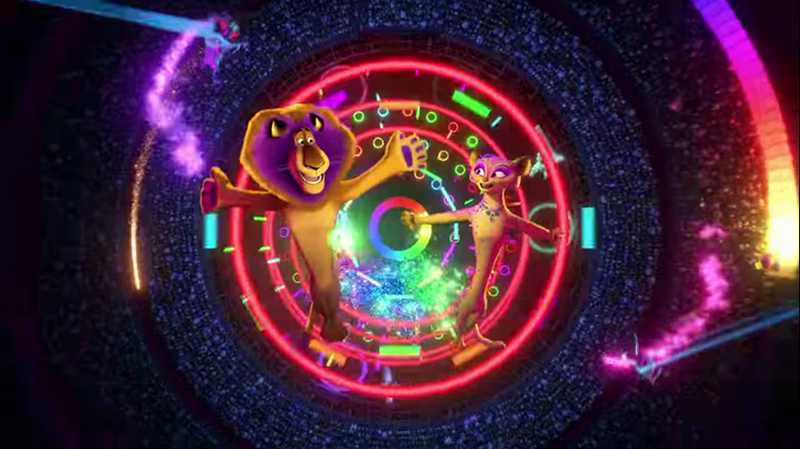 Coming off the success of the second film, the Madagascar franchise was able to expand with more short films, video games, and live stage shows and attractions. Madagascar: Escape 2 Africa would gross a worldwide tally of $604 million against a budget of $150 million, making it a major box-office hit. It is available on Blu-ray and DVD. Monsters vs. Aliens would be the first DreamWorks Animation feature to take advantage of the re-emergence of 3D by being produced directly in a stereoscopic format as opposed to being converted after completion. A parody of the cult B-movie science fiction films of the 1950s, it told the story of Susan Murphy. On the day of her wedding, she would be struck by a meteorite and grow nearly fifty feet in height. Grouped with monsters that had been locked up in secret, they would be called upon when an alien arrived to retrieve the meteorite energy that empowered Susan. Visually, the film was quite fun to watch. The action sequences were spectacular, specifically the battle with a giant robot in San Francisco, and there was great use of the sweeping and shaking camera movements. I appreciated that, while the film was produced with 3D in mind, it could still be enjoyed without feeling as though watching in 3D was necessary. I had an issue with some of the character designs, particularly the humans (other than Susan). But I guess that was sort of the point as they played up how unconvincing actors looked in such films. They sure looked more creepy than the creatures. I liked the film then and as I do now, but it was not without its flaws. Being a parody, the storytelling was intentionally conceived to be lame enough that it would be funny, and the star-studded cast, headlined by a lovable Reese Witherspoon, certainly sounded like they were having an absolute ball. But while the film was humorous, it was lacking a kind of odd charm that the old B-movies had. Perhaps the narrative was taking itself a little too seriously at times? Maybe if it had a little polish, the storytelling might have elevated the film enough to be more than just a casual pleasure. Monsters vs. Aliens had a fairly healthy commercial run, with one of its achievements being the highest grossing debut for an animated feature in IMAX theaters at the time. Critical and audience reception was mostly positive, but it wasn’t quite a success on the level of Shrek, Madagascar, and Kung Fu Panda. Still, DreamWorks did attempt to build a franchise with a short film, a pair of television specials, and a television series. In the end, however, the film just didn’t have the mileage to keep going, and a planned sequel never materialized. Monsters vs. Aliens would gross a worldwide tally of $382 million against a budget of $175 million, making it a decent box-office hit. It is available on Blu-ray and DVD. 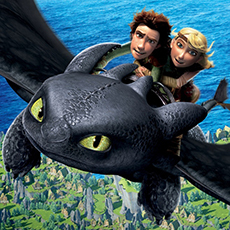 How to Train Your Dragon was the first of three films DreamWorks Animation would release in 2010. Based on a series of novels by Cressida Cowell, it told the story of Hiccup Horrendous Haddock III, the scrawny son of the Viking village chief, who would manage to take down the elusive and dangerous species of dragon known as a Night Fury. Unable to bring himself to kill as Vikings were supposed to, Hiccup instead formed an improbable bond with the dragon he would name Toothless. I believed without hesitation that How to Train Your Dragon had a visual majesty unparalleled by anything DreamWorks had put out before or since, even measuring up to the best the other studios had to offer. Much could be attributed to directors Chris Sanders and Dean DeBlois enlisting acclaimed cinematographer Roger Deakins as visual consultant. Utilizing his expertise in lighting and staging a scene, the filmmakers produced a breathtaking feast for the eyes that would not age with time. And this did not take into consideration the spectacular depictions of flight and fire that continued to inspire awe from audiences of all ages. Virtually everything about How to Train Your Dragon came together beautifully. The story was a compelling and emotional journey, full of heart and charm that enchanted viewers. It featured a fantastic voice cast with Jay Baruchel shining as Hiccup, helping shape the character into someone who was unique and lovable. John Powell composed a brilliant music score that evoked and enhanced the drama and magic that appeared on screen. I found it hard to imagine if any faults, however few there were, could hamper my enjoyment of the film and after numerous viewings I couldn’t find one. How to Train Your Dragon was a major success for DreamWorks. It would have a great commercial run, becoming the studio’s highest grossing non-Shrek film in North America. It received universal critical and audience acclaim. Of the three DreamWorks films released in 2010, it would be the only one to receive Academy Award nominations, one for Best Animated Feature and one for Best Original Score. With the success of the film, a new franchise was launched. It would spawn a collection of shorts, a television series, video games, and an arena show. More importantly, DreamWorks immediately gave the go-ahead for not one, but two sequels that would form a trilogy. How to Train Your Dragon would gross a worldwide tally of $495 million against a budget of $165 million, becoming a huge box-office hit. It remains the highest grossing DreamWorks Animation feature outside of the Shrek series in North America with a tally of $217 million. It is available on Blu-ray and DVD. Shrek Forever After would be the second of the three films DreamWorks Animation would release in 2010. It would also be the last film to date in the studio’s flagship Shrek franchise. Shrek was living happily ever after, but could hardly find a moment’s peace since becoming a father and a celebrated hero. Attempting to have just a day to himself for relaxation, he would be tricked by a vengeful Rumpelstiltskin, who would use the deal to alter reality to where the ogre didn’t exist. On the one hand, Shrek Forever After was visually stunning. I like how the alternate reality was different enough while keeping touches of what it used to be. And the utilization of lighting and color was very nice. But while it was probably the most polished of the Shrek films DreamWorks and PDI had produced, I felt like there were better looking films that year. There was certainly a better looking film from DreamWorks itself earlier that year in How to Train Your Dragon. Part of the reason why I felt the feature-length sequels to Shrek were unnecessary was that it seemed like they couldn’t come up with a plot that didn’t hinge on Shrek struggling with the happiness in his heart versus the perception of his nature. While the film tackled this in a new light and the narrative was dramatic, it always seemed like they were just milking what worked before and were afraid of telling a different story. And the continuity issue of how Rumpelstiltskin appeared here over how he appeared in the previous film made me feel as though the filmmakers were desperate for something. While he turned into what I thought was the best villain in the series, I just couldn’t get over the inconsistency. Shrek Forever After would gross a worldwide tally of $753 million against a budget of $165 million, making it the highest grossing of the three DreamWorks films released in 2010. It is available on Blu-ray and DVD. One of the things to admire about when DreamWorks and PDI teamed together had been that they always strove to make the most visually stunning film, even if it was initially designed to be a parody. Megamind looked quite amazing, appearing very much like the kind of superhero films it was sending up. The human character designs seemed cartoony in comparison to how fantastic everything else looked, but I thought that was sort of the point and part of its charm. The film was just so much fun to look at from start to finish without feeling like anything clashed. While the narrative was a bit hit and miss to me, it was still pretty good. The beginning was fun, the middle seemed to drag a bit, and then there was the exciting finish. But perhaps because it focused so much on being a parody of superhero films, specifically Superman, it never really seemed to develop an identity of its own. Fortunately, the film benefited from a great voice cast that knew how to use improvisation in support of the story as opposed to contending against it. And there was a fine musical score by Hans Zimmer and Lorne Balfe that also helped. Megamind just managed to be a profitable film for DreamWorks. It would be regarded as the highest grossing film in the careers of stars Will Ferrell and Tina Fey. And it was generally liked by critics and audiences. But the overall feeling was that, while the visuals and voice cast were great, the story just didn’t seem fresh. Certainly not so when compared to Disney/Pixar’s The Incredibles from six years prior or Universal’s animated film from just a few months earlier, Despicable Me, which also centered on a super-villain. Megamind would gross a worldwide tally of $322 million against a budget of $130 million, making it a modest box-office hit. It is available on Blu-ray and DVD. Kung Fu Panda 2 was the second feature film in the Kung Fu Panda franchise and the first DreamWorks Animation film on which Guillermo del Toro severed as executive producer as well as being the first feature, from any studio, with a solo female director in Jennifer Yuh Nelson. Po had become the Dragon Master and was now teamed with the Furious Five, but a past he could not remember would test his inner peace when the unstable Lord Shen would move to conquer China using weaponized fireworks. The first Kung Fu Panda was already one of the most beautiful films DreamWorks had made. This second film would merely refine and polish the style, enhancing what was already visually magnificent. The use of lighting and shading really stood out for me, making each setting unique from one another as well as setting it apart from the first film. And the martial arts sequences were always a blast to watch. But what was most impressive was the use of hand-drawn animation. Used in the first film just for the opening and in the end credits, their use in the second film as visions of Po’s past flowed wonderfully with the rest of the film and added depth to the narrative. Speaking of the narrative, the second film managed to be an engaging drama that didn’t diminish or take away from the lighthearted appeal that made the first film so much fun. Even at its darkest moments of Po becoming conflicted with who he was, there were also bits that made audiences smile, like Mantis mentioning the mating ritual of his species. The story was told in a way that could be understood and appreciated by all ages and coupled with the always fantastic voice acting from the returning and new ensemble cast made it all the more enjoyable. Kung Fu Panda 2 duplicated the success of the first film, just managing to top it as the highest grossing non-Shrek film from DreamWorks Animation at the time. It received equal critical and audience reception, who were appreciative of the film telling a darker tale while still maintaining its visual beauty and fun appeal. The film garnered a Best Animated Feature Academy Award nomination just as the first film did and would spawn more short films and videogames in the franchise. But its biggest impact was seen through its continued positive reception in China, where it would set the foundations of DreamWorks forming an animation studio in Shanghai to bring even more authenticity for a third film in the series. Kung Fu Panda 2 would gross a worldwide tally of $665 million against a budget of $150 million, becoming the highest grossing film directed by a solo female filmmaker to date. It is available on Blu-ray and DVD. Puss in Boots was the first spin-off feature from a DreamWorks Animation title, coming from the Shrek franchise. It was also the second film on which Guillermo del Toro served as executive producer. Having been an outlaw most of his life, Puss would get an opportunity to clear his name when a chance to recover the magic beans of his childhood legend resurfaced. But he would have to contend with the outlaws Jack and Jill, an old acquaintance in Humpty Dumpty, and a street-savvy feline in Kitty Southpaws. Being set in the Shrek universe, Puss in Boots managed to maintain the visual beauty from its parent franchise while developing a unique look of its own. I believe this was also the first of the films del Toro worked on where his artistic contributions were really present, adding to a style that brought depth to the storytelling. Being observed from the perspective of Puss and characters of his height, the world certainly looked big, allowing for greater details in the landscapes and objects to be seen. While the film called back to some of the earlier DreamWorks films in having a much more mature narrative, it was no less fun. I found it to be at least better than the latter two Shrek films in that it was a breath of fresh air and focused on telling a good story. I personally would rank it above Shrek 2. The influence of the Mexican outlaw feature films of old were present, even if younger audiences would be unfamiliar to appreciate them. But by keeping true to what it was telling, it was a fun little romp to enjoy. There was also a great music score by Henry Jackman, and the cast, headlined by Antonio Banderas, gave it their all. Given that this was a spin-off film, Puss in Boots was a huge success. It garnered the highest opening ever for a film released on Halloween weekend and maintained strong staying power during its run. It received high critical and audience response for its great visuals and charming wit. And it received an Academy Award nomination for Best Animated Feature. The success of the film would launch its own short film, a television series, and the development of a sequel. In some respects, Puss in Boots would branch off into its own franchise. Puss in Boots would gross a worldwide tally of $555 million against a budget of $130 million, making it a major box-office hit. It is available on Blu-ray and DVD. Madagascar 3: Europe’s Most Wanted was the most recent film in the series. While still trying to get back home to New York, Alex the lion, Marty the zebra, Melman the giraffe, and Gloria the hippopotamus would end up in Europe and run afoul of the murderous French Animal Control Captain Chantel DuBois. During their attempt to escape her clutches, they stowaway on a train containing down-on-their-luck circus animals. By the time of the third Madagascar, I think the filmmakers clearly embraced the Looney Tunes influence and used it to the benefit of the overall presentation. In addition to polishing the animation, the slapstick nature of the storytelling was played up for some great sight gags. The car chase through Monte Carlo and the practice sessions in the Alps could be appreciated by all ages for their comic timing and for how great they looked. But the circus performance in London was a great visual spectacle of color and animation that really put this entry over as the best in the series. In fact, it’s one of my favorite scenes ever animated by DreamWorks and PDI. Despite what could be a couple of instances of continuity errors here and there, the third film had a much more focused narrative now that they embraced the slapstick comedy of the series. While it had moments of some pathos, it was all about making the story fun and funny, which I must admit to being surprised it pulled off. The returning cast was obviously having a blast and this clearly infected the new cast, who sounded like they were having just as great a time recording and improvising their lines, with Martin Short a standout as the lovable Italian sea lion Stefano. Madagascar 3 became the biggest success for the studio outside of the Shrek series. It also became the highest grossing of all DreamWorks Animation films outside of North America. The film received the best critical and audience approval of the franchise to date, being won over by the ever improving mixture of slapstick comedy and a narrative that had heart. The live show attractions were revamped to incorporate the new circus performances, and the growing success of the film series would allow for the development of a fourth feature. Madagascar 3: Europe’s Most Wanted would gross a worldwide tally of $747 million against a budget of $145 million, which would presently make it the highest grossing non-Shrek film ever released by DreamWorks Animation. It is available on Blu-ray and DVD. Though the main Shrek series was brought to rest with Shrek Forever After, new franchises had taken off to big success. The Madagascar series saw great improvement both financially and in critical and audience reception with each film. The Kung Fu Panda series continued to dazzle and entertain all across the globe. And even Puss in Boots had a great start in spinning-off from Shrek. The mediocre box-office runs for Monsters vs. Aliens and Megamind would see the company phase out parody films, but they had found a new franchise to build off of in the huge success of the much beloved How to Train Your Dragon. It would appear that DreamWorks was back on a roll and managing to stay in league with Disney and Pixar by producing films that garnered great interest across the board and across the globe. Yet it seemed that every successful film would automatically receive sequels that would be put into production right away, almost as though there was now a reliance on developing franchises over a diverse collection of films like their competition. In Part Four of our look at the history of the DreamWorks Animation films, we watch the company lose momentum and money, placing the studio in a dire predicament that would put its very survival in jeopardy.